Pavel Tretyakov probably had little idea just how popular his private painting collection would become. Today, the State Tretyakov Gallery is Russia's leading repository for national fine art. While you can spend hours walking the halls, let's take a look at the most important artworks to see if you’re short on time. The Tretyakov’s icon collection is astounding, home to some of the finest examples of 12th century Kievan Rus art. 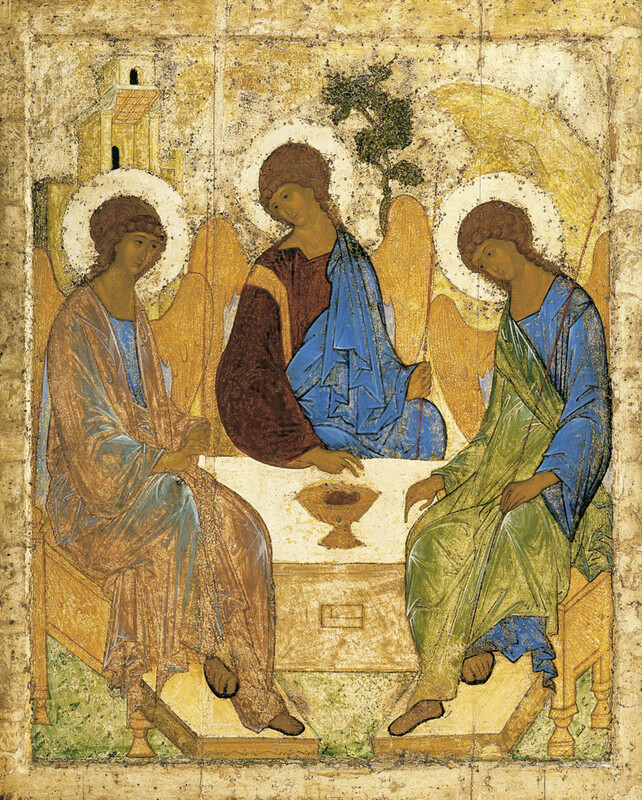 One of the most important is Trinity (1425-1427) by Andrei Rublev, the most famous religious artist in Russian history. Fun fact - the first person to publicly exhibit icons was the famous Russian ballet impresario, Sergei Diaghilev, an admirer of Tretyakov. He gave a boost to Russian culture abroad in the early 20th century when he toured Europe with his troupe of ballet dancers and artists. If you want to better prepare for your viewing of Trinity, then find out how to read and comprehend a Russian icon by referring to this article. Serov was a portrait master. Russian emperors and royal family members posed for him, as did famous contemporaries, composers, writers and artists. 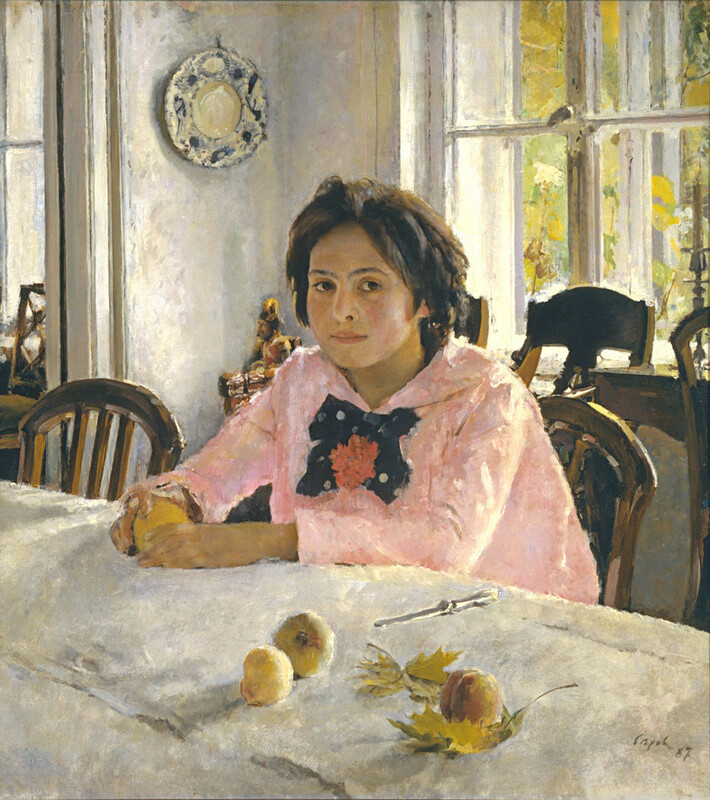 But one of his most widely acclaimed artworks is a portrait of an ordinary 12-year-old girl, Vera Mamontova – Girl With Peaches (1887). The artist captured the moment by accident: Vera had just taken a seat as he arrived at their house. Her father was Savva Mamontov, the powerful entrepreneur and art patron. Serov recalled that he wanted to capture the girl’s freshness and the light she exuded. These are the two most important paintings to see on the first floor. Now, let’s go upstairs! 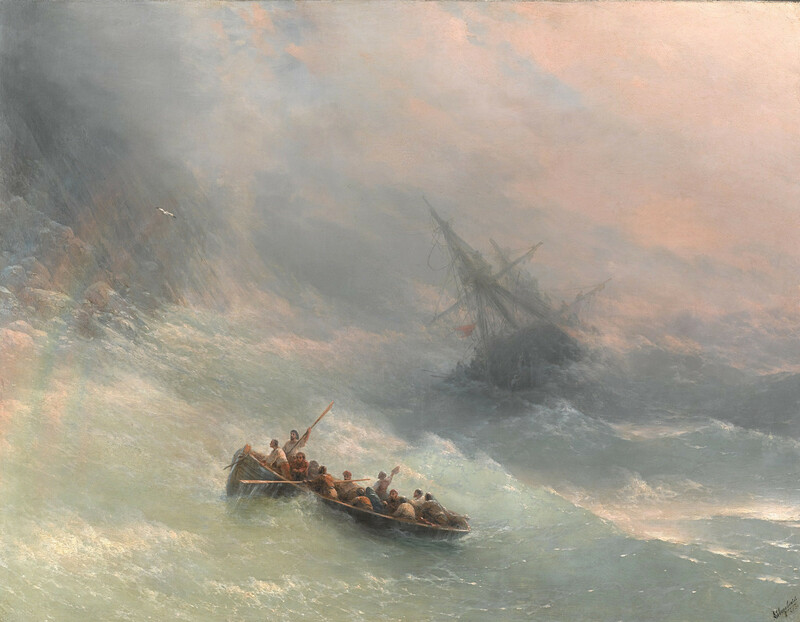 Every important Russian art auction in London has at least one painting by this leading seascape artist. His most famous masterpiece, The Ninth Wave, hangs on the walls of the State Russian Museum in St. Petersburg. The Tretyakov Gallery has some of his other masterpieces, among which is The Rainbow (1873). While there are dozens of other masterpieces that will catch your attention when running through the Tretyakov’s halls, we advise taking a minute to stand before and enjoy this dramatic canvas. 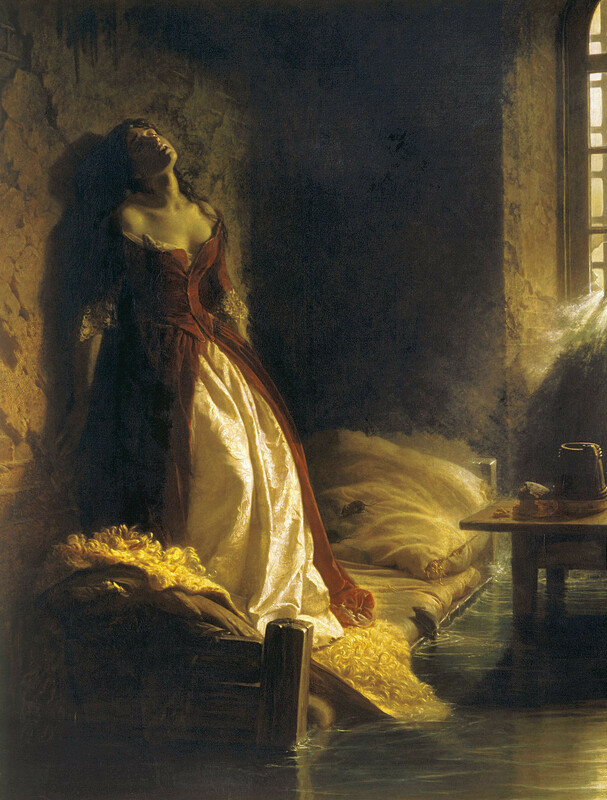 Princess Tarakanova (1864) depicts a flood inundating St. Petersburg’s Peter and Paul Fortress. The so-called Princess Tarakanova (in fact, her real name was never known) was in prison for falsely claiming to be the daughter of Empress Elizabeth (1709-1762). Look at the dark walls of her cell and the despair in her face when she realizes that the water is inexorably rising and that no one will come to her rescue. The true story is less dramatic, but no less tragic. In fact, she succumbed to tuberculosis in the fortress in December 1775, after only 10 months of incarceration. 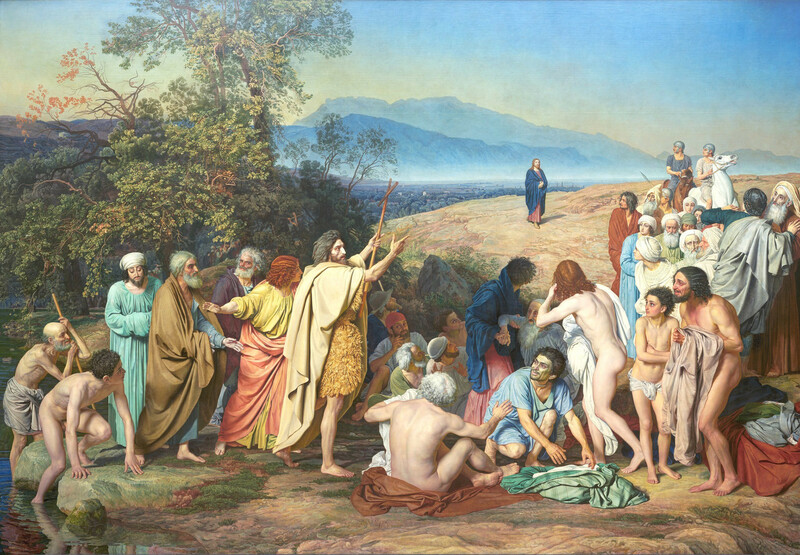 Pavel Tretyakov was only able to purchase the sketches for this giant painting, on which the artist worked 20 years (1837—1857). Ivanov’s magnum opus was acquired by Emperor Alexander II, and only in the 20th century did it appear in the Tretyakov, hung in a separate hall. You can stare at The Appearance of Christ Before the People for hours and still not comprehend all its details, symbols and figures. Take your time, and survey this masterpiece from different distances and angles. You can’t confuse this painter with any other – Shishkin is credited with the greatest depictions of Russian forests at any time of the day and in any season. 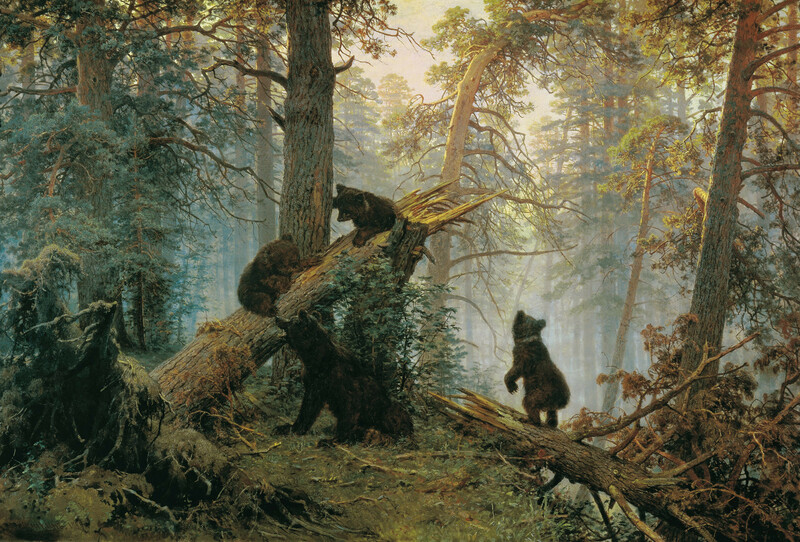 Originally, Morning in a Pine Forest (1889) had no bears, and they were added later by another artist, Konstantin Savitsky. 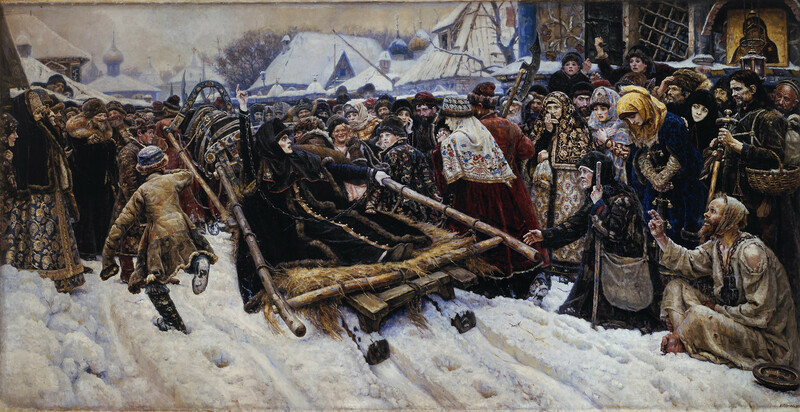 For some reason Pavel Tretyakov removed Savitsky’s name from the painting’s caption. In Soviet times a fragment of the painting became a wrapper for the famous candy – Mishka Kosolapy (Clumsy Bear). Take a look onthose candies and other popular Soviet sweets. Vasnetsov dedicated his entire life to folklore art, and most Russians imagine the characters of the famous tales just as he depicted them. 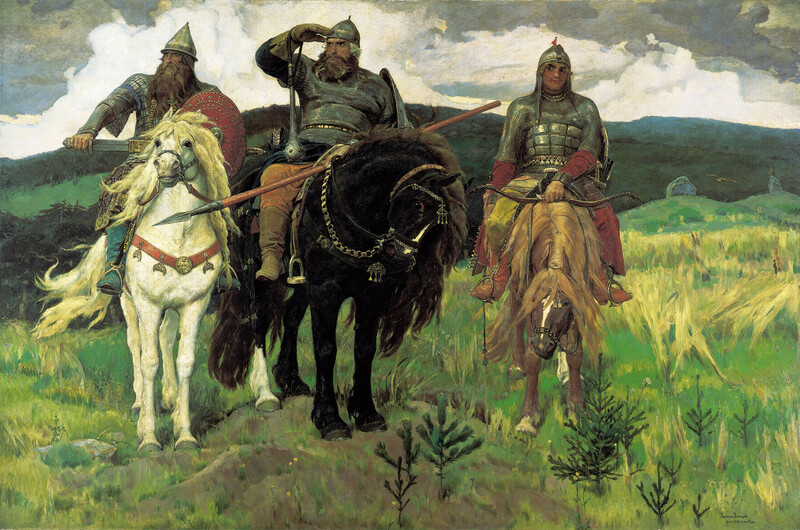 Bogatyrs (1898) is one of Vasnetsov’s major artworks, on which he spent 20 years, and it depicts the most popular Slavic superheroes: Dobrynya Nikitich, Ilya Muromets and Alyosha Popovich (pictured from left to right). Before moving on, take in more of Russian folklore’s mysterious magical world as seen in two other Vasnetsov paintings in the same hall – Alenushka, and Ivan Tsarevich Riding the Grey Wolf. This artist created several massive historical paintings reflecting Russia’s spirit and landscapes. Boyarina Morozova (1884-1887) is one of the most impressive and emotional panels in Russian art. For her religious affiliation as an Old Believer this medieval noble woman was exiled to a monastery, something that was equal to imprisonment at the time. The dramatic story behind this painting reflects one of the most important issues in 17th century Russia: The reform of the Orthodox Church led to a split in the country. Those remaining faithful to the old ways were subsequently referred to as Old Believers, and persecuted by the state. Repin's most famous masterpieces Barge Haulers on the Volga and Reply of the Zaporozhian Cossacks are hanging on the walls of the State Russian Museum in St. Petersburg. The Tretyakov Gallery owns a portrait of Leo Tolstoy, and Unexpected Visitors, as well as the canvas, Ivan the Terrible Killing his Son (1885), which is the best choice to go see if your time is limited. 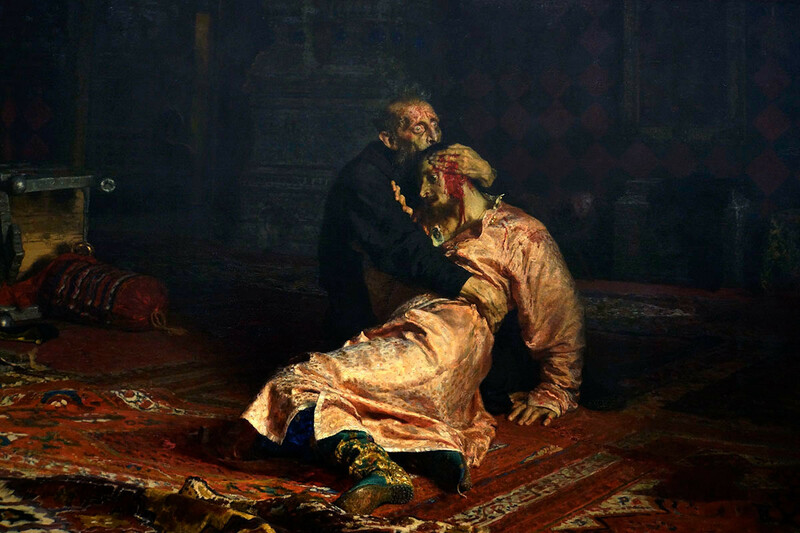 Repin was enthralled with the story that the impulsive Ivan the Terrible had killed his only heir (at that moment) during an argument. Just look at the fear and panic in Ivan’s eyes. Repin worked hard on that image, trying to find the right face. Mikhail Vrubel collaborated on the jubilee project to mark the life of poet Mikhail Lermontov, making about 30 sketches for the poem, Demon. 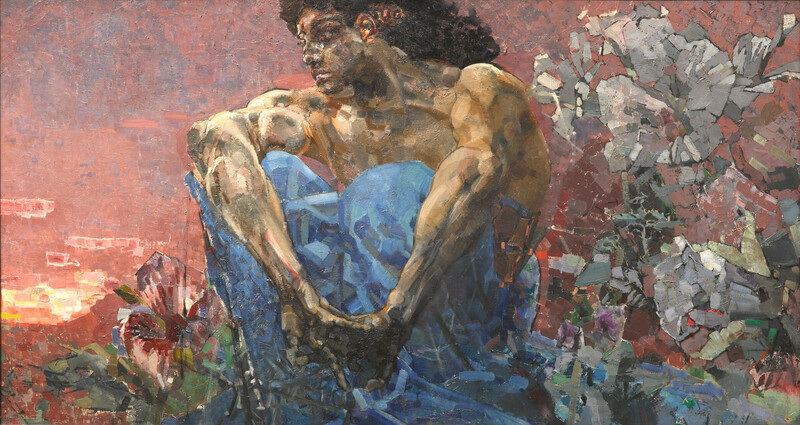 Clearly Vrubel’s canvas, The Demon Seated (1890), was inspired by Lermontov’s character, a fallen angel, an eternally sad and suffering creature that symbolizes a person’s inner contradictions. The museum has an entire hall dedicated to Vrubel, one of the most talented Russian artists, and one of the fathers of the Russian avant-garde. Already been to the Tretyakov Gallery? Why not visit the Pushkin Museum of Fine Arts next – here are five reasons to check out its large collection of Western art from a broad range of periods. Editor's note: The part about Repin was updated on Jan. 16, and Russia Beyond apologizes for an error that originally claimed Barge Haulers on the Volga and Reply of the Zaporozhian Cossacks are in the Tretyakov. In fact, they are in the State Russian Museum. Quiz: Can you recognize the harsh social commentary in these 19th century Russian paintings?